Kreg is big in the USA and now getting more attention in the UK. Their extensive range of products spans everything from the famous Pocket Hole Jig to router tables and a lot more in-between. They have a big range of specially designed and built mole type clamps with various clamping jaws. To use them, there is nothing better than their Klamp Table. We decided to see whether Kreg have really got to grips with workholding. 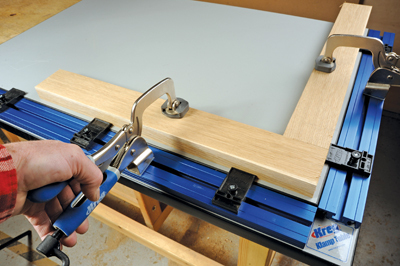 Kreg tools and work aids have developed over time so the various elements reflect that. In the case of the Klamp Table its first requirement is to work with the well known Pocket Hole system. After that it has been designed to be used for general clamping for use when drilling, routing, etc. The question is can it do all those things well? The box containing the Klamp Table is very heavy. Take it out of the box with care and do follow the instructions for assembly so it goes together properly. A key element is the two clamping rails. These are held in place with a huge number of short coach bolts and I found it easiest to hold the bottom panel on the edge and slide the clamp rails down the rows of bolts before tightening them up. The top panel then butts up to the rails and lastly the black plastic stops are fitted on the rails along with the two clamps supplied with the table. 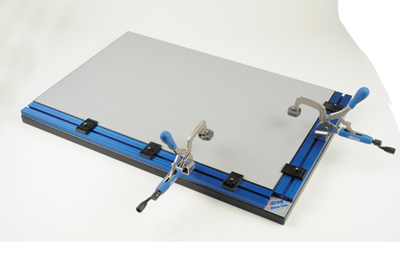 Normally this table would mount on the same coated steel base as the large Kreg router table, although you could make up a base of your own with new fixing holes. The Klamp Table is perfect for aligning perpendicular components when creating pocket hole joints which is the primary function. Kreg suggest you can also do other operations such as drilling or routing, but I think the first time you accidentally scar the work surface you might feel slightly sick considering the high cost of this kit. It does seem like overkill it terms of weight and cost but if you are a 'Kreggie' then it is ideal for using with their pocket hole devices.